It has been two months since I set off to reach the centre of the galaxy. I’m happy to report that I made it. For those not following my adventures, I’m part of the Distant Worlds 2 expedition, a ragtag group of Elite Dangerous explorers who have set out to cross the galaxy and construct a new space station at its core, a safe haven for all those pilots who find themselves far from home. After innumerable jumps, my ship, the Roisin Dubh, has finally docked within the metal confines of that new station, the Explorer’s Anchorage. It’s still not wholly assembled, but I imagine it has that new car smell. The Tesco Gold coffee I was drinking in my last report has since been jettisoned out the airlock (I need to make my trips to the bins exciting somehow). 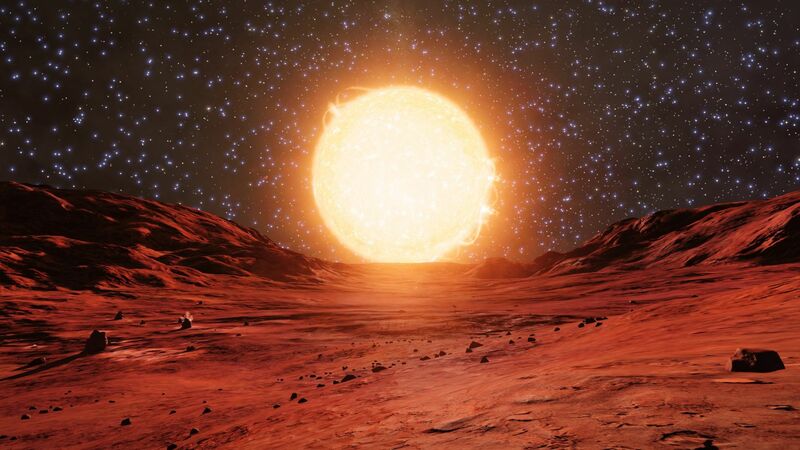 So I treated myself to some proper ground coffee to celebrate my arrival at Sagittarius A*, the supermassive black hole in the centre of our galaxy, and was feeling pretty good about myself. I was arrested shortly afterwards, but I’ll get to that. As a fleet, we’re now 25,000 light years from Sol and it hasn’t felt as overwhelming as I’d feared. The organisers of the trip have done a good job of parcelling out the waypoints, so we’re not taking on too much at once. It’s still a hefty time commitment. My ship averages a 37ly jump and the distance between waypoints can be between 4000 – 7000 light years. But it’s manageable. After we left the Omega Mining Operation I assumed we wouldn’t see a port until we got our new station up and running, but there were still isolated outposts like Eagle’s Landing and Polo Harbour. Pit stops on the highway that leads to Colonia, the galaxy’s second bubble of civilisation (a remote region that developers Frontier encouraged players to colonise during several community events). It can still get a little lonely. Most of the time I won’t see anyone else in deep space until I get to a designated basecamp at the end of a week’s route. It’s a good job there are plenty of sights on the way. 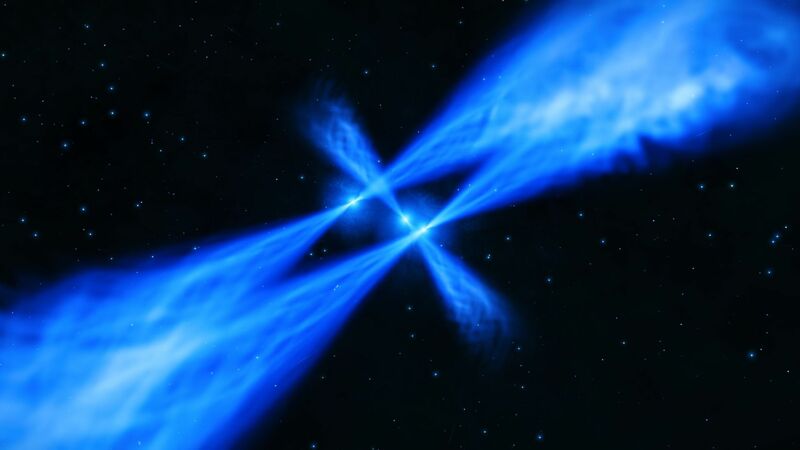 I visited a stellar phenomenon in which electricity arced between clusters of spikey crystalline structures within a cloud of stardust, a space thunderstorm. I didn’t dare venture far into it, unsure my low-powered shields could take a direct blast. Further into the journey, on a moon called Insinnergy’s World, there was a grove of blue tubular structures sprouting from the surface. I was on the dark side of the moon when I touched down. 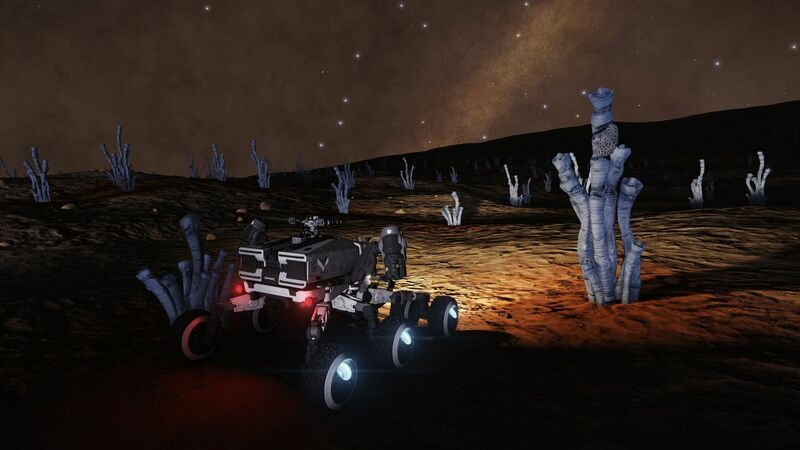 When I launched my Surface Recon Vehicle (space jeep) to go wandering among the growths I discovered they emitted strange, otherworldly noises. All was eerily still under those foreign stars. I stayed a while, I don’t know for how long, listening to their song. I paid a visit to The Crux (Nuekuae AA-A h52). 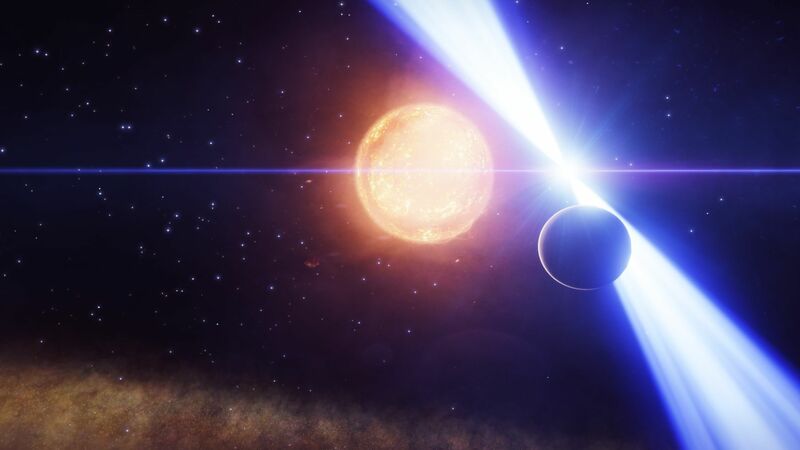 This system contains three neutron stars that are distractingly close to one another. Honestly, it’s too many stars in one place. Viewed from a certain angle they overlap, forming the shape of a cross. It’s rather stunning. Also, people never tell you just how colourful space can be. Turns out it’s not all infinite darkness. I’ve flown through a veritable rainbow of nebulae. The dark silhouette of my ship has floated in a tranquil sea of deep green. It has plunged through an eruption of purple and crested vibrant red waves. Then between waypoint 04 and 05 is a system designated Blaa Phoe NC-D d12-230. Or as it’s commonly known, the Death Spiral. This is one of those places where the galaxy is a bit broken. This system contains a white dwarf star, around which orbits a gas giant. The planet completes a full orbit in just 15 minutes. In cosmic terms it’s a sheer speed demon and it spits in the face of known physics. It’s well passed the roche limit, when the gravitational field of a large object will tear apart smaller bodies. I previously mentioned how inattention can be a pilot’s greatest danger. I almost proved myself correct here. I tried to get as close to the speeding planet as possible, which by proxy brought me closer to the star’s core. I couldn’t hear my alarm going off as temperatures in my ship rocketed. I’m a fan of classical Earth music and Rob Halford was espousing the merits of leather and motorcycles, perhaps a little too loudly. I eventually realised something was wrong when I noticed the smoke and small fires that sprung up. Had I popped a heat sink only a few seconds later I would have found myself performing my own death spiral. It’s between the points of interest where the real work takes place though. Jump after jump through empty and unassuming systems. That’s when the space madness takes hold. The trip from waypoint 05 and 06 in the Empyrean Straits has been the hardest so far. I don’t know which cosmic entity I’d annoyed, but all the planets I seemed to find were boring, icy bodies. 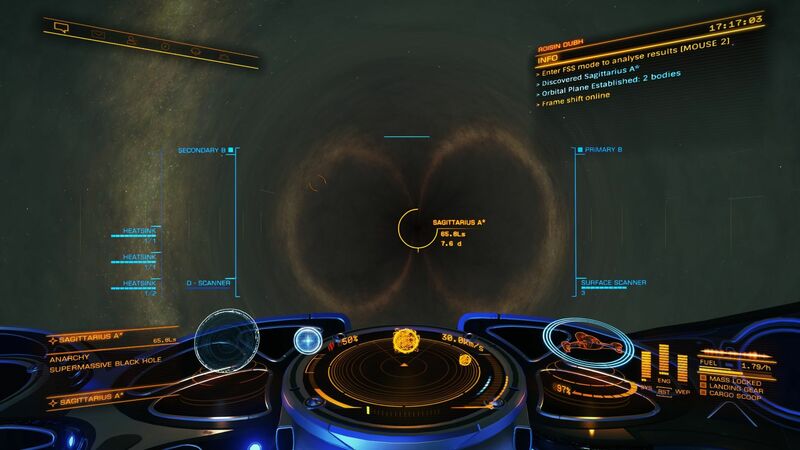 You can’t land on many of them and they’re worth bugger all in terms of credits (in Elite Dangerous you scan undiscovered planets and trade that data for cash when you get home). But you could scan dozens of these dull systems and not make as much money as you would finding a single Earth-like world. Icy bodies are space rubbish, and I was convinced at one point I’d found the greatest concentration of the things in the galaxy. Oh how they mocked me, but I overcame my trial by ice. I finally jumped into the Stuemeae FG-Y d7561 system where that new station for far-flung explorers was under construction. What I found was a system at war with itself. Shortly before the fleet arrived in this system, Frontier generated a stage-one model of our new space station. Just a central housing module with some engines. As players mined materials and delivered them to the station, its appearance would be updated week by week, showing our progress. 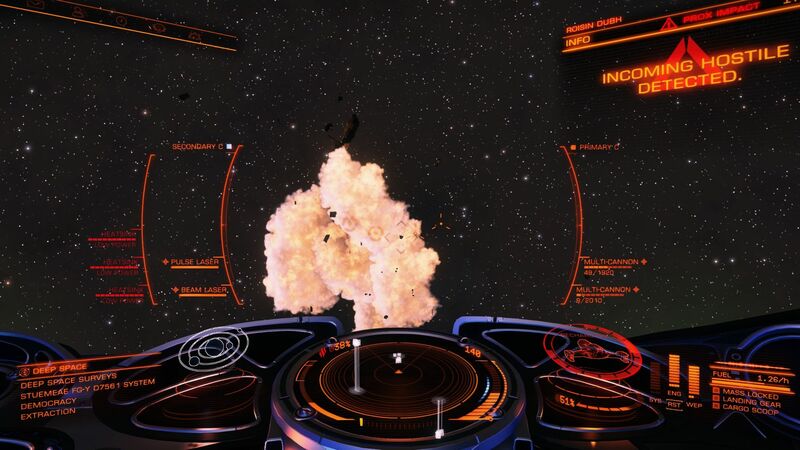 But when the new station appeared Elite’s background simulation also kicked into gear. 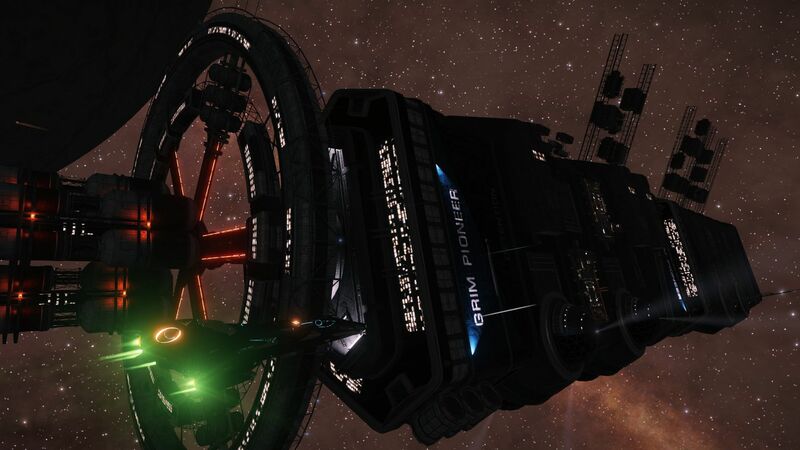 Like any other station in the game, Explorer’s Anchorage would have its own reputation systems, factions and forces generally vying for control of the system. And for some reason, our new shelter in the wilderness was being overrun by criminals. 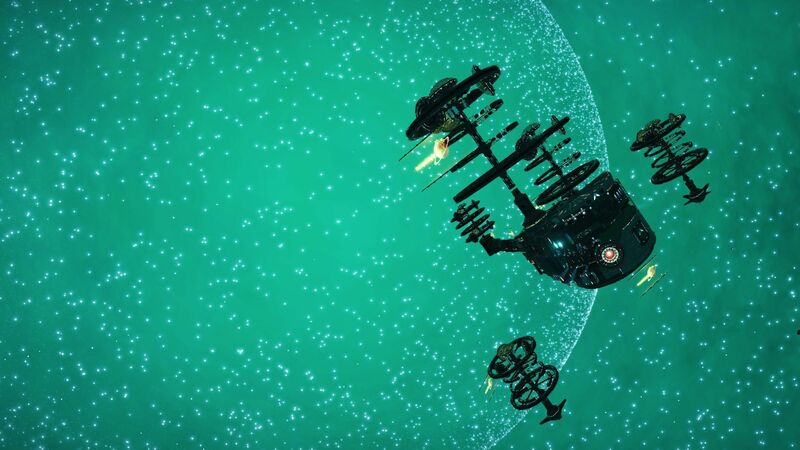 It turns out that when Frontier zapped a new space station into existence, they forgot to create an asteroid field or “nav beacon” nearby, where NPC pirates could gather and fight against NPC police vessels. Basically, these sites provide a place for wanted criminals to die “naturally” within the game’s ecosystem, because the odds are generally tipped in favour of the security forces. Without these arenas, the criminal population was booming. Our home away from home soon entered a state of “civil unrest”. If we didn’t do something fast, our new station, Explorer’s Anchorage, would enter lockdown, denying commanders access to its facilities. No docking, no refuelling, no repairs. Typical really. We travelled all the way to the centre of the galaxy only to start a riot. Perhaps there’s a lesson here about how exploration, even for the noblest of goals, is an inherently violent act. Well, any ruminations on man’s inherent aggression had to wait. 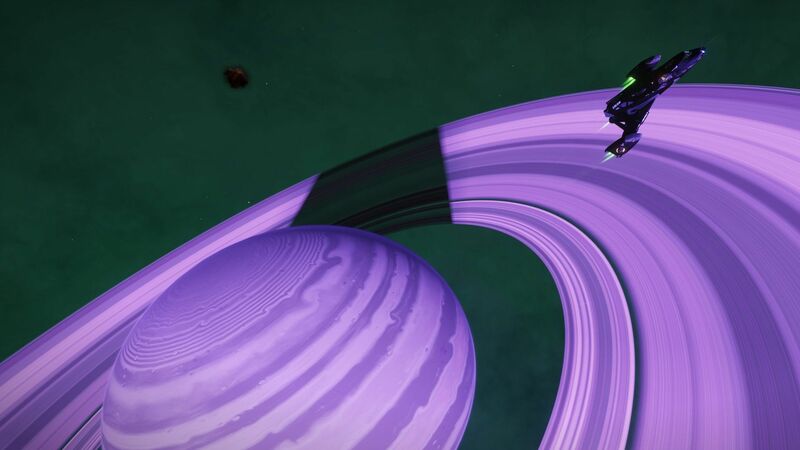 The call was put out on the Distant Worlds 2 discord server: if we wanted to save our new home, we’d have to go bounty hunting. Explorer’s Anchorage isn’t a military installation. It’s a great big laboratory set up to study a supermassive black hole. The outfitting options are slim and the weapons on offer even more so. Normally a ship like my Imperial Clipper can withstand a few rogue elements, but like many others on the expedition I was piloting a stripped-down machine. However, I wouldn’t let it be said that the Roisin Dubh didn’t do her part. Mining lasers were swapped out for multi-cannons and our fleet of paper planes went to war. Without any fancy equipment to deploy, it was best to rely on hit-and-run tactics. I’d pilot to a pirate signal, take out one or two ships in a group and then jump out while my armour held. I had to fly like a rookie again. Constantly managing my subsystems and diverting power between engines, weapons and shields on the fly. It was kind of exhilarating. I’d never finish a fight with more than 50% of my armour intact. Then, as I was answering one distress call, I ran into some real trouble. I dropped out of supercruise expecting to quickly take down a couple of light fighters, but as soon as I entered the fray things went wrong. My cockpit canopy took a direct hit from a missile and it was blown out. When this happens you’re directly exposed to the vacuum. So all sound is muffled and your emergency oxygen supply kicks in. You also lose visual data. You can’t see your weapon’s reticle (or information on your target) if there’s no glass to project it on. The three ships in front of me were big, chunky Anacondas. And identical. I knew two of them were friendly, but one was an enemy. So there I was with my oxygen supply counting down, trying to eyeball the situation, and correctly guess which of these three ships was the bad ship. Long story short: I unloaded a lot of laser into a friendly ship. Making me a brand new target for every pilot in the system. So I ran away like a hero. I didn’t want another player blasting me to bits over a fine equivalent to a hefty parking violation. 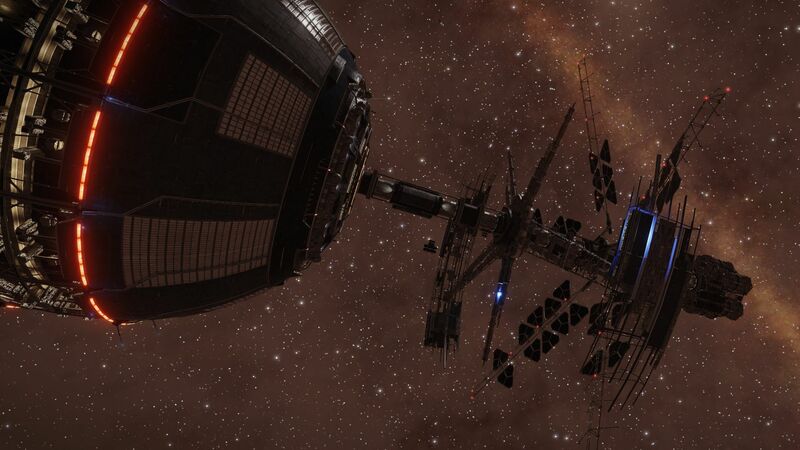 Back in our half-finished station, I contacted the station authorities to pay the fine like an upstanding pilot. But there’s a force in the galaxy just as inescapable as the gravity of a black hole. Bureaucracy. I’m saying they arrested me. Just like that. The next thing I know, I’m docked in the hanger of the Grim Pioneer, a prison ship about 5 light years out from Sagittarius A*. On reflection, I’m lucky the prison ship is here. Without it, any commander being punished for a crime would have been sent to the next nearest prison ship, back in the bubble, essentially undoing their journey. 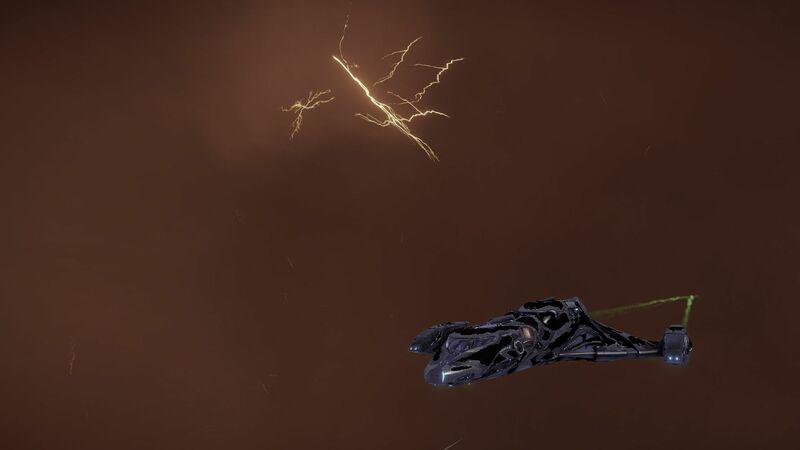 The Grim Pioneer is just a short jump away. Now this newly released convict is preparing to go even further. 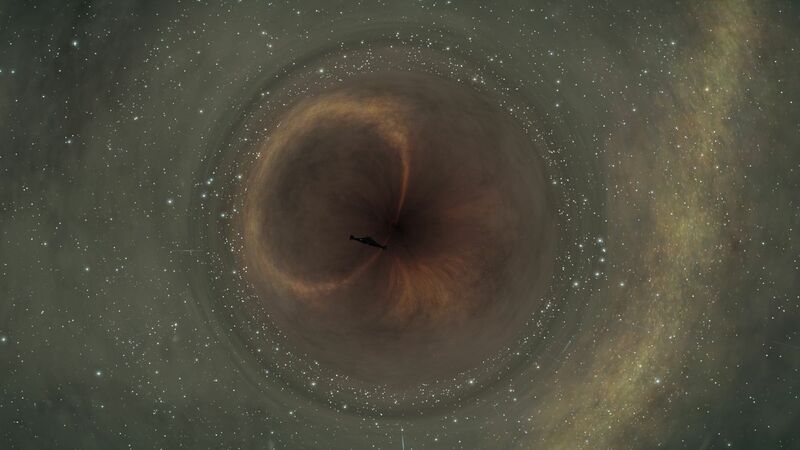 Getting to Sagittarius A* was an achievement in itself but it’s the shortest leg of the trip. Once we leave Explorer’s Anchorage we truly won’t see any other station until we’re on our way back from Beagle Point, on the far side of the galactic plane. Fleet attrition (losses due to any number of threats, or from players simply getting bored and quitting) is expected to ramp up from here on out. The risks will mount with every jump and we’ll have to rely on our comrades to help see us through more than ever. I can’t wait. Tagged with Diary, feature, Frontier Developments, Elite Dangerous.